O6-methylguanine-DNA-methyltransferase (MGMT), Genetic polymorphism, Malignant brain glioma, Temozolomide (TMZ), Drug resistance. Glioma, developing from spongiocyte induced by neural ectoblastic, accounts for 35.2%-61.0% of primary intracranial tumors in human . Malignant glioma (WHO grades III and IV), with the feature of extensive intracranial infiltrates and metastasis, is easy to relapse after surgery. Routine postoperative adjuvant therapy is required to improve the prognosis of patients with malignant glioma. Because the blood brain barrier, chemotherapy regimen would be frequently adopted based on alkylating agent to treat malignant glioma sufferers. Temozolomide (TMZ), as a second generation alkylating agent (imidazole four oxazine derivatives), has advantages of absorbing quickly, spreading around the body rapidly, freeing from the liver metabolism, and entering the cerebrospinal fluid through the blood brain barrier [2-7]. Cytotoxicity of TMZ forms mainly through the alkylation of guanine oxygen-6 of DNA in tumor cells, resulting in the damage of tumor cells. Repair guanine to eliminate the DNA alkylation damage in tumor cells caused by alkylating agent. Mechanism of malignant gliomas’ drug resistance is that MGMT acts on the alkylation groups within the tumor cells and further repairs guanine to block the DNA alkylating damage in tumor cells [8-11], leading to an unsatisfactory curative effect with significant efficacy differences. Therefore, MGMT activity has an important influence in alkylating agent chemotherapy of malignant glioma. Moreover, other studies also show that multiple exons of MGMT gene composed of five exons, experience polymorphism [12-15]. The transcriptional starting site is in exon 1; Coding regions are from exons 2-5; Cysteine (Cys-145) is the active site of exon 5 . Thus, the discussion of MGMT gene exon polymorphisms of malignant glioma cells are important to further clarify the correlation between genetic polymorphisms of MGMT and temozolomide resistance in malignant brain gliomas patients and prognosis of malignant brain gliomas and provides a clue for further treatment. 35 patients with gliomas (WHO grades III and IV) registered in neurosurgery of our hospital from the year of 2007 to 2012 and confirmed by pathology after the surgery without the acceptance of chemotherapy and with complete follow-up data were collected in our study. Among all these patients there are 22 males and 13 females aged from 12 to 61 with an average age of 36 and 21 cases graded WHO III and 14 graded WHO IV; patients participate in the group voluntarily and promise the cooperation with follow-up and informed consent in this experiment. Karnofsky grade of the participants should be beyond 60 and blood routine examination tells the White Blood Cell (WBC) ≥ 4.0 × 109/L, Platelets (PLT) ≥ 100 × 109/L, HB ≥ 100 g/L; no serious liver and kidney function damages are involved; women of pregnancy and lactation are excluded. All patients are treated with radiotherapy and (TMZ) chemotherapy after tumor resection. The content of the study includes: assessment of patients' overall survival time; detection of MGMT protein expression of tumor patient’s specimens with the immunohistochemically test method, detection of MGMT gene polymorphism for positive specimens of MGMT protein expression. Classification of patients according to MGMT protein expression and MGMT gene polymorphism. Assessment of the relationship between MGMT gene polymorphism in malignant glioma patients and the patients’ total survival after (TMZ) chemotherapy. Conduct immunohistochemistry staining to paraffin specimens of malignant glioma tissue and take specific operation regarding Histostain-Plus Kit. The known positive malignant glioma tissues of MGMT protein serve as positive control while PBS group negative control. Divide the MGMT protein expression into three levels: cases of no MGMT expression or with MGMT positive cells proportion lower than 10% are negative; cases with MGMT positive cells accounting for 10%~10% are weakly positive and cases with MGMT positive cells proportion beyond>30% are strong positive. Extract genomic DNA of paraffin specimens with glioma tissue with paraffin specimens’ DNA extraction kit and take the specific operation according to TIANamp Genomic DNA kit instructions. Reserve it at the temperature of -20°C after its being identified to be qualified. Design the primers of 1~5 exons through the gene primer design software of Primer5.0 MGMT according to the established human MGMT gene cDNA sequence [16,17]. Primers are synthesized by Shenzhen Genomics Institute (the primer sequence is shown in the Figure 1). Refer to the DNA polymerase TaKaRa Taq instructions to understand specific reaction system of PCR. Reaction products are purified through agarose gel electrophoresis and determine the DNA sequencing of MGMT gene exon PCR products with ABI377 automatic gene analyser. 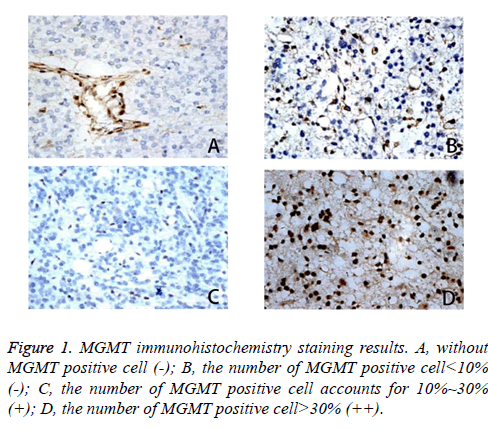 Figure 1: MGMT immunohistochemistry staining results. A, without MGMT positive cell (-); B, the number of MGMT positive cell<10% (-); C, the number of MGMT positive cell accounts for 10%~30% (+); D, the number of MGMT positive cell>30% (++). After surgery, the treatment of patients is based on the (TMZ) chemotherapy, tracking the patients’ total survival time: the time of beginning to accept chemotherapy to death or the time of the last follow up. Calculate the survival rate within 3 y with Kaplan-Meier method and draw the survival curves with the record of data. Analyze the relationship between MGMT gene polymorphisms and the 3 y survival rate of patients in the treatment of TMZ through SPSS13.0 statistical software and Fisher's exact probability method. The result of P<0.05 presents the difference is statistically significant. Immunohistochemistry results divide the MGMT protein expression into three levels (Table 1): cases of no MGMT expression or with MGMT positive cells proportion lower than 10% are negative; cases with MGMT positive cells accounting for 10%~30% are weakly positive and cases with MGMT positive cells proportion beyond>30% are strong positive (Figure 1). There are total 14 cases of negative expression and potential positive expression of MGMT and a total of 21 cases of MGMT positive and strong positive expression . Histogram is drawn according to the positive result (Figure 2). Table 1. MGMT positive cell number. Figure 2: Results of MGMT negative and positive expression proportions with the negative 40% and the positive 60%. Conduct MGMT gene polymorphism analysis on 21 malignant glioma specimens with MGMT positive and strong positive expression and it turns out MGMT gene polymorphism exists in 12 cases (Table 2). According to the automatic DNA sequencer’s analysis on 5 exons of MGMT gene of samples and the comparison with the known MGMT gene polymorphism reported in literatures , there is no signal of polymorphism in exon1 and exon2. But exons 3-5 are detected with polymorphism, marked with “c”. The DNA sequence of exon3 of the five samples is consistent with the polymorphism reported in literatures, the first base of codon84 turns C to T, making TTT take place of CTT and thus changing leucine into phenylalanine in terms of amino acid exchange. In 3 cases, the third base of codon94 of exons 4 changes from C to T, the codon from TTC to TTT, but the amino acid sequence experiences no difference, all being phenylalanine consistent with the mutations in previous reports [18,19]. In 4 cases, the codon160 of exons 5 turns from GGA to AGA, replacing glycine with arginine. This mutation case was reported by Imai . Table 2. Result of gene polymorphism. The first base of codon84 of exon3 turns C to T (MGMT-3 group); the third base of codon94 of exon4 changes from C to T (MGMT-4 group); the codon 160 of exon5 turns from GGA to AGA (MGMT-5 group), make a comparison between above groups to judge the existence of statistical significance. 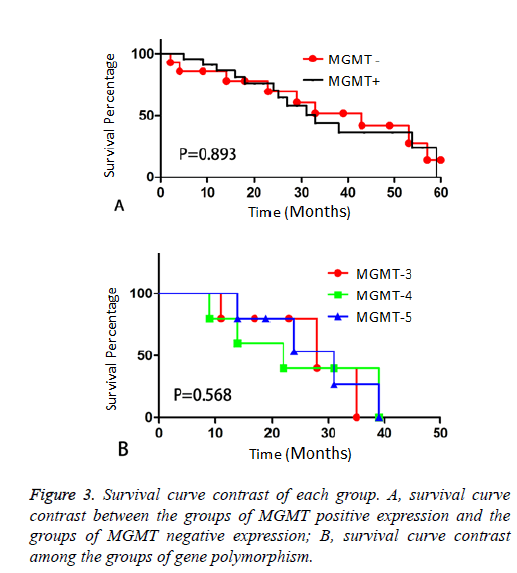 Results of survival condition of each group (Table 3): the OS of MGMT negative expression group is 28.23 ± 1.12 months on average, the OS of MGMT positive expression without polymorphism is 22.56 ± 2.15 months on average, the OS of MGMT-3 group is 23.62 ± 3.34, MGMT-4 group 21.32 ± 3.52 months and MGMT-5 group 23.83 ± 4.72 months. There was no statistically significant difference between groups of MGMT positive expression (P>0.05). Survival curves are drawn as below (Figure 3). Table 3. Survival time of each group. Figure 3: Survival curve contrast of each group. A, survival curve contrast between the groups of MGMT positive expression and the groups of MGMT negative expression; B, survival curve contrast among the groups of gene polymorphism. The results suggest that only 12 in 35 malignant glioma cases are found MGMT gene polymorphism, which is respectively demonstrated by the fact that the first base of codon84 turns C to T, making TTT take place of CTT and thus changing leucine into phenylalanine in terms of amino acid exchange, that the third base of codon94 of exon4 changes from C to T, the codon from TTC to TTT without the change of amino acid sequence, generally believed no pathological significance and that the codon160 of exon5 turns from GGA to AGA, replacing glycine with arginine. All these mutations are consistent with the recent literature reports [14,19]. The OS of patients of the 3 groups with MGMT gene polymorphism is MGMT-3 (23.62 ± 3.34 months), MGMT-4 (21.32 ± 3.52 months), MGMT-5 (23.83 ± 4.72 months). The results are compared with the groups of MGMT positive expression without polymorphism and it turns out to be no significant difference in terms of statistical analysis (P>0.05). The study finds that MGMT gene polymorphism has no obvious effect on TMZ resistance treatment of the patients with malignant glioma and the prognosis of the treatment. This may result from the fact that the sample is moderately small and fails to detect polymorphism in key positions. In recent years, many experts and scholars at home and abroad make a lot of researches on MGMT gene polymorphism [13-15], and this study further explores the correlation between gene polymorphism and TMZ resistance of patients with malignant glioma. Combining the results of this study with the relevant literature, we found the MGMT gene polymorphism is mainly missense mutation and synonymous mutations, and many are hybrid mutations of a single base. These mutations didn't happen in key areas, thus failing to cause the obvious differences in protein function . Detection and assessment on certain locus mutations may be of guiding significance in the treatment and prognosis of malignant glioma. But whether it is correct requires increasing samples in the following constant researches. The experimental results in this study provide very meaningful clues and direction of further exploring the correlation between MGMT gene polymorphism and TMZ resistance of patients with malignant glioma and prognosis of the treatment. Wen J, Chen W. Effects of teniposide combined with semustine on O6-methylguanine-dna methyltransferase expression in patients with glioma. Chinese J Neuromed 2010; 1. Brandes AA, Ermani M, Basso U. Temozolomide as a second-line systemic regimen in recurrent high-grade glioma: a phase ii study. Ann Oncol 2001; 12: 255-257. Yung WK, Albright RE, Olson J. A phase ii study of temozolomide vs procarbazine in patients with glioblastoma multiforme at first relapse. Br J Cancer 2000; 83: 588-593. Yung WK. Temozolomide in malignant gliomas. Semin Oncol 2000; 27: 35-40. Oliver-Louis C, Stephan H, Henry D. Safety and efficacy of temozolomide in patients with recurrent anaplastic oligodendroglioma after standard radiotherapy and chemotherapy. J Clin Oncol 2001; 19: 2449-2455. Antonadou D, Paraskevaidis M, Sarris G. Phase-II randomized trial of temozolomide and concurrent radiotherapy in patients with brain metastases. J Clin Oncol 2002; 120: 3644-3650. Stupp R, Dietrich PY, Ostermann K. Promising survival for patients with newly diagnosed glioblastoma multiform treated with concomitant radiation plus temozolomide followed by adjuvant temozolomide. J Clin Oncol 2002; 20: 1375-1382. Tanaka S, Kobayashi I, Utsuki S, Oka H, Fujii K. O6-methylguanine-DNA methyltranspherase gene expression in gliomas by means of real-time quantitative RT-PCR and clinical response to nitrosoureas. Int J Cancer 2003; 103: 67-72. Esteller M, Garcia-Foncillas J, Andion E. Inactivation of the DNA-repair gene MGMT and the clinical response of gliomas to alkylating agents. N Engl J Med 2000; 343: 1350-1354. Hegi ME, Diserens AC, Godard S. Clinical trial substantiates the predictive value of O6-methylguanine-DNA methyltransferase promoter methylation in glioblastoma patients treated with temozolomide. Clin Cancer Res 2004; 10: 1871-1874. Hegi ME, Diserens AC, Gorlia T, Hamou MF, de Tribolet N. MGMT gene silencing and benefit from temozolomide in glioblastoma. N Engl J Med 2005; 352: 997-1003. Rusin M, Samojedny A, Harris C. Novel genetic polymorphisms in dna repair genes; O6-methylguanine-dna methyltransferase (MGMT) and N-methylpurine-DNA glycosylase (MPG) in lung cancer patients from Poland. Hum Mutat 1999; 14: 269-270. Otsuka M, Abe M, Nakabeppu Y. Polymorphism in the human O6-methylguanine-DNA methyltransferase gene detected by PCR-SSCP analysis. Pharmacogene 1996; 6: 361-363. Imai Y, Oda H, Nakatsuru Y. A polymorphism at codon 160 of human O6-methylguanine-DNA methyltransferase gene in young patients with adult type cancers and functional assay. Carcinogene 1995; 16: 2441-2445. Wang L, Zou J, Hong J. Polymorphism research of O6-methylguanine- DNA transferase gene of patients with esophageal carcinoma. WCJD 1998; 6: 560-563. Nakatsu Y, Hattori K, Hayakawa H, Shimizu K, Sekiguchi M. Organization and expression of the human gene for O6-methylguanine-DNA methyltransferase. Mutat Res 1993; 293: 119-132. Tano K, Shiota S, Collier J. Isolation and structural characterization of a cDNA clone encoding the human DNA repair protein for O6-alkylguanine. Proc Natl Acad Sci USA 1990; 87: 3253-3259. Egyhazi S, Ma S, Smoczynski K. Novel O6-methylguanine-DNA methyltransferase snps:a frequency comparison of patients with familial melanoma and healthy individuals in Sweden. Hum Mutat 2002; 20: 408-409. Liu R, He Y. The relationship between O6-methylguanine- DNA transferase gene polymorphism and cancer susceptibility. Cancer Distortion Mutation 2002; 14: 2. Inoue R, Abe M, Nakabeppu Y, Sekiguchi M, Mori T. Characterization of human polymorphic DNA repair methyltransferase. Pharmacogenetics 2000; 10: 59-66.